Summertime means being outdoors, and the Fourth of July means being outdoors with really cool stuff like fireworks and music!! So this year, we were fortunate enough to join the good people at Palisades Rocks the Fourth at their 7th annual shindig – and man, it was a really good one!! Aside from a wide variety of food trucks who kept the masses fed and well hydrated, the Second Stage at the upper deck kept the people entertained while they waited for the main gates down to the field itself to open. On the second stage were performers Joel Henry Stein and Dale Fisher – both artists providing some great sets of music. Shortly after 5 p.m., the main gates opened and the football field at the Palisades Charter High School was filled with the nearly 6,000 people who had come for some fun and to celebrate America’s Independence Day!! As the field filled full of Fourth fans fit for festivities (really, did I just say that?! ), the main part of the evening was kicked off with the National Anthem, performed by one single Palisades High School Concert Band trumpeter, followed then by various selections performed by the entire Concert Band (Directed by Arwen Hernandez). As a former band geek, I was pleased to see that music programs are still alive and well in at least some schools!! Shortly after, the OOKS OF HAZZARD – a mostly all-ukulele band [some bari and tenor ukes along with a bass uke (yes!!) along with drums, vocals, and even an accordion] – took the stage and got the crowd up and dancing! 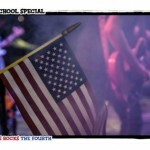 After their set, the stage was changed out and then AFTER SCHOOL SPECIAL took the stage. Don’t recognize the name? Well, you probably know who the members are – just not in this configuration. The band, who, on any other night, would go under another, less family-friendly name (taken from the title of a Rolling Stones song that rhymes with Hitch), includes L.A. area guitarist/singer/songwriter Jonny Kaplan along with his buddies, drummer Dave Krusen (Pearl Jam), guitarist Christopher Thorn (Blind Melon), Rami Jaffee on keyboards (Wallflowers, Foo Fighters), Jessy Greene on violin (Pink/Foo Fighters), and Jokin Salaverria (Lazy Stars/Crusade) on bass. And even though their name might suggest that they play kids tunes, they actually cover a plethora of songs by some of the greatest bands in rock music – everyone from The Grateful Dead to The Band to Buffalo Springfield to The Velvet Underground, and everything in between. And rather than simply mimicking the original tunes, this band really puts their uniquely talented stamp on every song they do. And joining AFTER SCHOOL SPECIAL on stage to help out on a few songs were African Reggae/AfroBeat/Soul singer ROCKY DAWUNI, Australian pop artist KATJA GLIESON, and Foo Fighter guitarist CHRIS SHIFLETT, whose recent tangle with a soccer ball brought him to the stage on crutches and in a cast. Don’t worry, though, like a trooper, Shiflett (or “Shifty”) did what any professional would do – he took a seat, strapped on his Fender guitar, and cranked out the rock and roll! Nothing can keep that guy down! Towards the end of the set, the band welcomed back their stage guests, as well as the producers, some staff, and a few friends to join them in singing the Fourth of July tradition – “This Land is Your Land” by Woody Guthrie! The sing-a-long also included the 6,000 voices from the audience – which really got the mood set for the night’s big finale. With a few perfectly-timed test blasts going off as the sing-along came to a close, the lights were dimmed on the field and the sky was suddenly lit up by a nearly ½ hour display of amazing fireworks!!! Music was played over loudspeakers, taking the hair-raise effect up a few notches – and, just as the climax to the traditional John Phillips Sousa march “The Stars and Stripes Forever” blared through the loudspeakers, the finale of the fireworks show began – a full four minutes of AMAZING blasts and “OOOOOH and AWWWWW” evoking bursts! 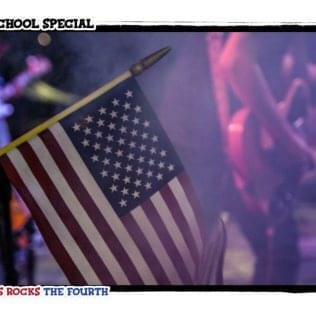 I can’t think of a better way to have spent the Fourth of July 2014 than this great evening of festivities and music with these bands that played their hearts out. Thanks, Palisades Rocks, and thanks to all the musicians! What a fun night!!! *Making the night extra special: 200 foreign exchange students who are spending their summer at Pepperdine and who were brought to the event to experience a little taste of the American tradition of Independence Day. They sure got a good idea of what it’s all about, and they definitely got a great night of music along with one heck of a fireworks show. But with their enthusiasm and excitement at being up front for the live music (seriously – it was like a soccer game was in play), what they gave back was an energy that would have raised the roof, had PCHS had one over their football stadium! Thanks, kids!!! This Land is Your Land (Woody Guthrie) w/ Ooks of Hazaard, Chris Shiflett, Rocky, Katja, Production Crew, Staff, and the entire Audience! !